APA recommends using 12-point Times New Roman font. If not using Times New Roman, then another serif typeface should be used for its readability. Only use different typeface in figure descriptions to add style to the paper (section 8.03). Use double-spacing throughout the entire paper.To add double-spacing in Microsoft Word, highlight all the text you want double-spaced, then click on Page Layout. Next to the word Paragraph click on the arrow. Under Spacing, Line Spacing, select Double and then click OK. Put two spaces after the period for each sentence in the body of the paper (Note, use only one space after a period in your references at the end of the paper). Microsoft Word does not have a setting to automatically put in two spaces at the end of a sentence, but you can set-up the grammar check to alert you when only one space is used. In Word 2007, click on File, then click Options. Next, click on Proofing. Under When correcting spelling and grammar in Word, click on Settings. Next to Spaces required between sentences, change the setting to 2. Click OK to exit. This setting will alert you to single spaces after a period with the green squiggle that shows when there is a grammar error in your paper. Leave 1 in. margins from top to bottom and side to side. 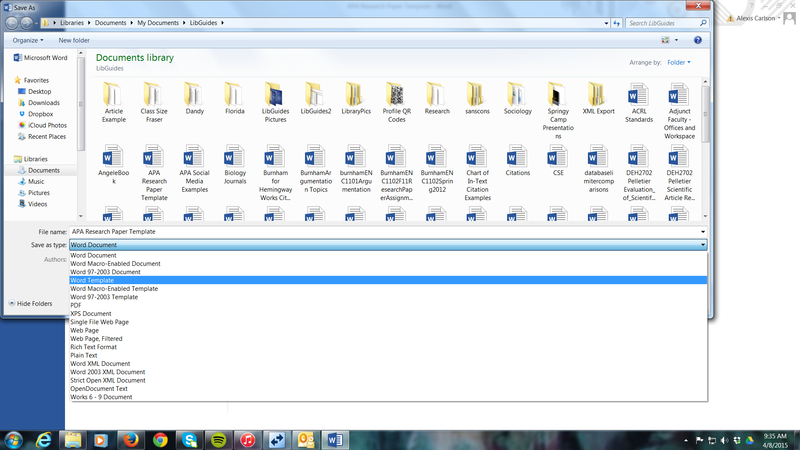 Microsoft Word usually is set to 1 in. margins. You can check this by clicking on Page Layout, then click on Margins. The margin you are using is highlighted, select Normal if it is not already selected. APA style recommends placing two spaces after a period that ends a sentence. This rule is often not enforced by professors. The reasoning behind it is to aid in proofreading. You can read more about it in the APA Style Handbook on pages 87-88. 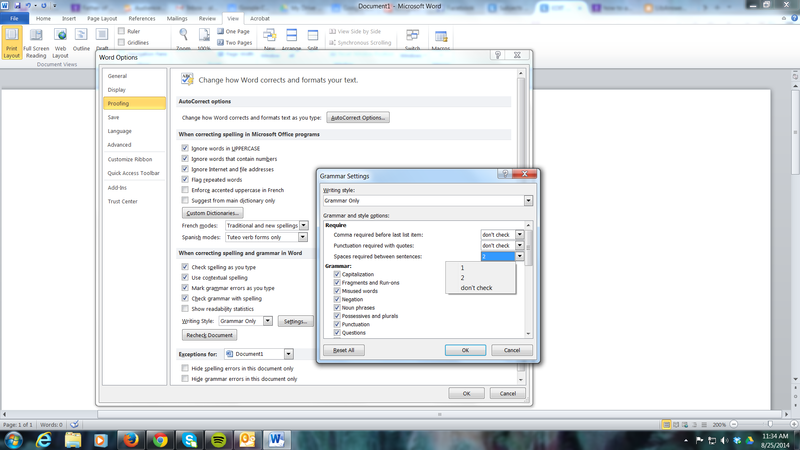 Microsoft Word 2010 and later editions does not allow the user to put in two spaces after a period in any automatic way. You can set-up your grammar check to alert you when you have failed to place two spaces after a period. To do this, go to File-Options-Proofing-Writing Style-Grammar-Settings. In Spaces Required Between Sentences, select 2. Now when you type your paper and insert only one space after a period, you will see a small green squiggly where you fail to put in two spaces, once you do a grammar check of your paper. Keep in mind that APA does not call for two spaces after any period (such as for abbreviations or in the reference list) ONLY when a period ends a sentence do you need two spaces. Using Microsoft Word 2007, set-up your APA Style paper. 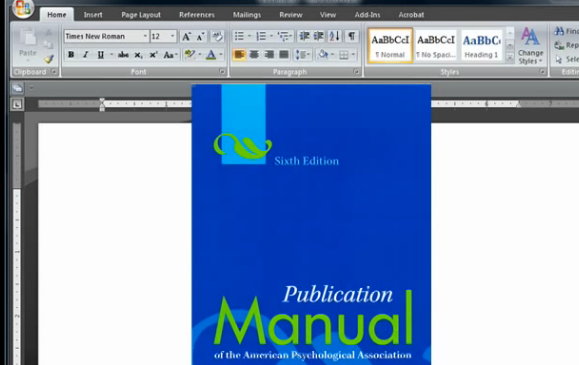 Describes how to format your paper in APA style using Microsoft Office for Mac 2008. 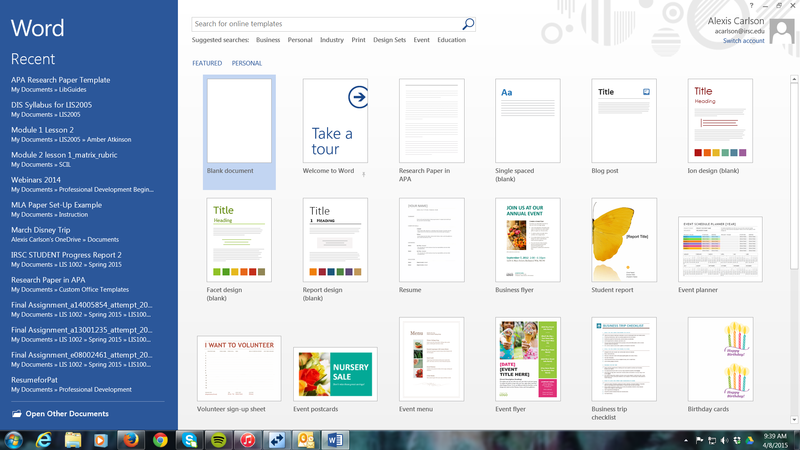 Then when you open Word, you will be able to choose a template rather than a blank document. You might have to select Personal to find your template. before it. The shortened title needs to make sense, it is not simply the first 50 characters of the longer title. The running head is on the left, on the right is the page number, starting with 1. Centered on the page is the full title of the paper, the author's name is on the next line, and the institutional affiliation (your school) is on the third line. before the title. The abstract is typed without any indentation. Finally, we begin to type the paper! The full title starts it off at the top center of a new page. For the rest of the paper, you only need the title and page numbers in the header. Remember to cite!